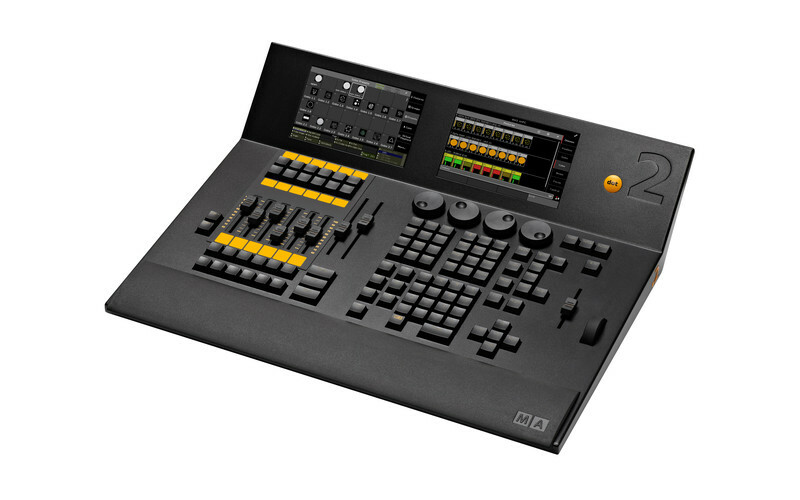 Intuitive operation is the core of the dot2 philosophy and with a comprehensive set of connectivity hardware on all console models, the dot2 range is suitable for most theatre, touring, corporate, television and education lighting environments. The easy to operate dot2 software is available in multiple languages and provides onboard Help and Direct Hints to guide a new user to operate the console to its full potential. A full range of clever programming and playback features provide intuitive access to advanced functionality. Access to all functions is via a Smart Dialogue screen which ensures you can control and record what’s intended. Automated tools; simplified cue-list management and multiple playback pages enable you to have full control. The dot2 will feel familiar to theatrical users, 100mm faders provide full access to the master playback list at all times. A tactile level wheel gives access to lighting levels and a graphically assisted touch screen helps you control all features. Build for touring; the dot2 hardware is compact, durable and remarkably lightweight. Live Time, Tap Sync and multiple touch screens allow instant access to all playback functionality. And sophisticated features like Soft-LTP automatically preserve key-lighting levels without going through black. Its optional modular plug & play F-wings and B-wings allow playback expansion and the full-tracking-back-up functionality ensures your show runs trouble free. The dot2 XL-F is an dot2 core console with a dot2 F-wing built-in. Still with a small footprint it includes the full programming section, master playback section, 8 additional fader playbacks and 16 additional individual playback buttons. Three built-in touch screens and support for one external touch screen ensure the dot2 XL-F has the flexible hardware required for almost any kind of show. The dot2 XL-B is an dot2 core console with a dot2 B-wing built-in. Still with a small footprint it includes the full programming section, master playback section, 6 fader playbacks and 48 additional individual playback buttons. Three built-in touch screens and support for one external touch screen ensure the dot2 XL-B has the flexible hardware required for almost any kind of show. The dot2 F-wing and dot2 B-wing offer modular playback expansion to any of the dot2 consoles or dot2 onPC. The dot2 system supports a total of two F-wings and two B-wings per dot2 core console. Built-in wings on an dot2 XL console are also counted, therefore a maximum of 6 internal touch screens are possible. The wings are connected Plug & Play via Ethernet (IPv6) and can be assigned to the correct fader or button location within the console in seconds. Normal network rules apply allowing wings to be placed remotely. 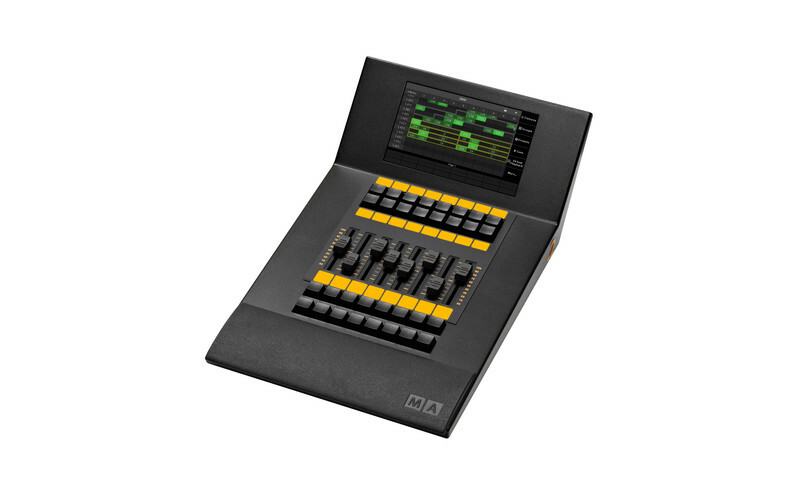 The dot2 F-wing provides additional 8 faders and 16 playback button with an integrated touch screen for any dot2 console or dot2 onPC. The dot2 B-wing provides additional 48 playback button and an integrated touch screen for any dot2 console or dot2 onPC. The dot2 Node4 (1K) is the easy way to access four DMX outputs from a dot2 console. The dot2 Node4 (1K) connects to a dot2 console or dot2 onPC software via a Plug & Play network connection. The user can easily choose output configuration 1-4 or 5-8 from the dot2 software set-up screen. The dot2 Node4 (1K) does not increase the channel capacity of a dot2 console, which is limited to 4,096 channels. 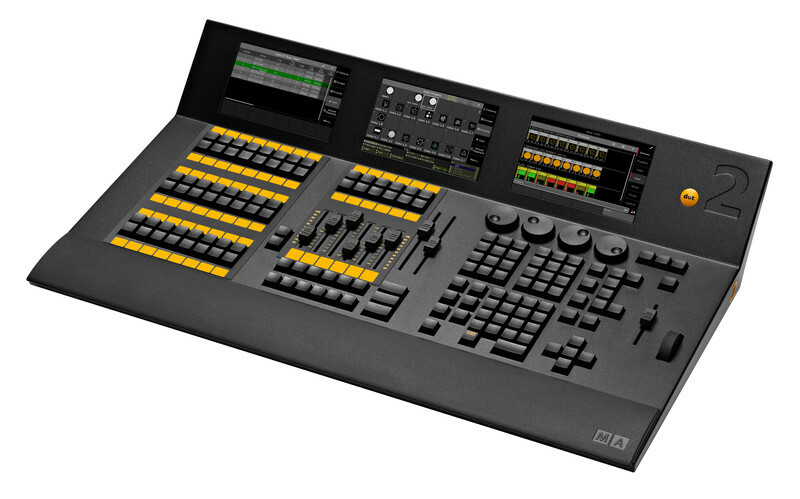 Additionally, the dot2 onPC software can output up to 1,024 channels of DMX when connected to a dot2 Node4 (1K). Normal network rules apply allowing nodes to be placed remotely.